The Lower Feather River flows below Lake Oroville and is famous for having one of the largest returns of both wild and hatchery chinook salmon and steelhead in California. 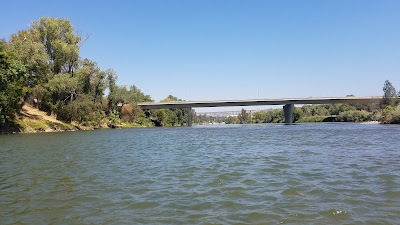 This river is considered a tailwater fishery whereas it flows below the tallest dam in the United States, the Oroville Dam. The river is diverted into two parts from the Thermalito diversion pool below the dam: one path towards the Thermalito Afterbay and the other towards it's natural historical flow through the city of Oroville. Although the best time of the year to fish the Lower Feather is during the spring and fall, steelhead can be found throughout the system all year round. 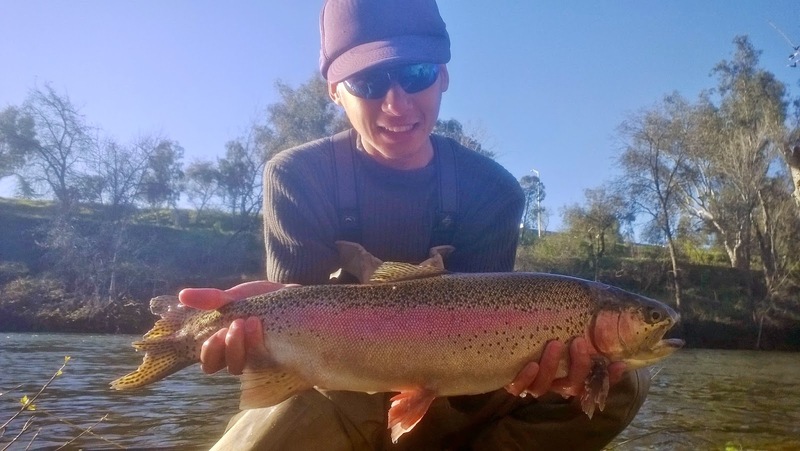 This fishery is accessible to both new and experienced anglers and is one of the best rivers to learn how to fish for the fly angler's greatest target, the anadromous steelhead. The regulations for the Lower Feather River can be a bit confusing so I've created a cheat sheet for anglers who want to know where exactly they can and cannot fish. 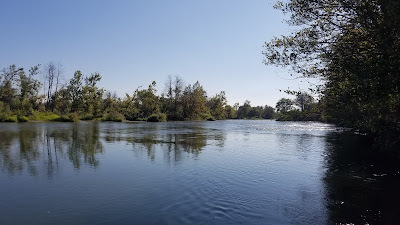 You can find that here: CA DFG Fishing Regulations: Feather River & American River. All wild steelhead must be released. A) From Fish Barrier Dam to Table Mountain bicycle bridge in Oroville. Closed to fishing all year. B) From Table Mountain bicycle bridge to Highway 70 bridge. Open: January 1st - July 15th. Only barbless hooks may be used. 4 hatchery trout or hatchery steelhead** in possession. No take or possession of salmon. Notice that this section closes July 16th - December 31st to all fishing. This section is known as the "low-flow" section stretching from the Feather River hatchery to the Thermalito Afterbay Outlet. No fishing 200ft from Hatchery pipe outlet. C) From Highway 70 bridge to the unimproved boat ramp above the Thermalito Afterbay Outfall. D) From the unimproved boat ramp above the Thermalito Afterbay Outfall to 200 yards above the Live Oak boat ramp. Open: All year for all other species except salmon. 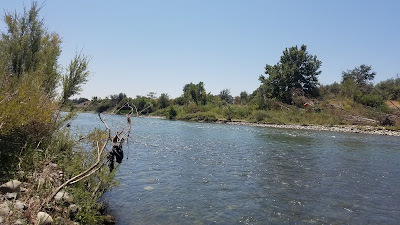 This section is the most fished section of the Feather River and is often subjected to regulation misunderstandings. Just remember that this section stretches from the Outlet all the way downstream to Live Oak. This section is known as the "high-flow" section due to the added flows from the Thermalito Afterbay. E) From 200 yards above Live Oak boat ramp to the mouth. For purposes of this regulation, the lower boundary is defined as a straight line drawn from the peninsula point on the west bank to the Verona Marine boat ramp. 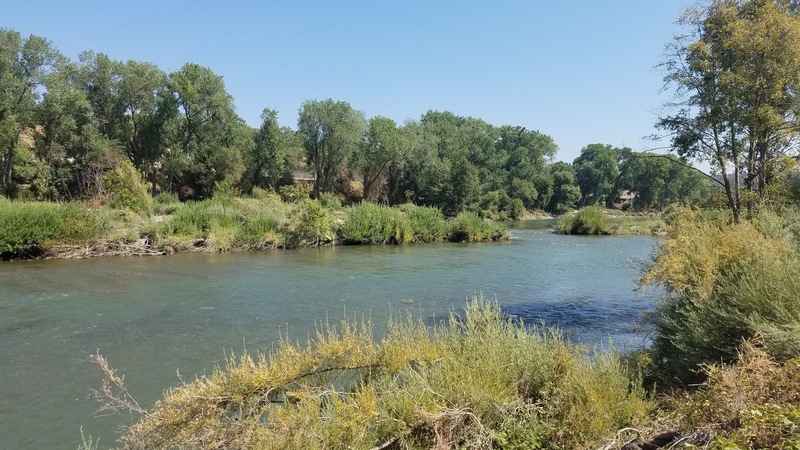 These are the most popular fishing access and riffles in the Lower Feather however there are many other unnamed riffles and access points throughout the river that can be productive. The first access point most upstream of the Lower Feather is the Hatchery Section that is only open to fishing from January 1st to July 15th. You can park along Arline Rhine Memorial Drive and hike down to the river. This section of the river is crossable in certain tailouts and riffles however be cautious of the deceptively deeper runs. There are several different types of water in this section which can hold fish. Bridge Riffle is the first riffle/run in the section of the Feather that is open all year round. To access the west side park along Wildlife Area Access Road. To access the east side park next to the Pat Alley Memorial Dog Park pond. This section is not crossable so plan accordingly on which side you want to spend time on. I find that most anglers prefer the east side as they can hike down further to the other riffles. Outhouse Riffle is the next riffle/run about 300yds below Bridge Riffle. This section has a long riffle that drops off into a deep run where it eventually becomes frog water. Mathew's Riffle is the following riffle after about half of mile of frog water. This riffle is more of a run that runs along the western bank. The water along the bank is deep so it is best fished from the eastern side. This riffle has been flatten out after the 2017 floods. You can cross the river in the tailout above the riffle during normal or low flows. Further into the Oroville Wildlife Area is where you will find the remaining fishing access. The majority of this section can be accessed from Fisherman's Gate formerly known as White Gate. Robinson's Riffle is what I consider the beginning of the Wildlife Area section. This a wide shallow riffle that comes to a steep deep drop-off. There are also several good riffles around White Gate that can hold fish. This section is crossable when the flows are normal or low however be cautious of the deep spots. The next set of riffles are better accessed from the southern bank of the river. Osprey Riffle is a deep riffle that is only fishable from a driftboat. Eye Riffle makes a slight curve north then west again where it eventually widens and flows towards the Afterbay Outlet. The Outlet marks the "high flow" of the Feather River as the water from the afterbay adds more volume to the river. There are a few riffles in this section that hold fish. The higher upstream you are towards the Outlet the better your chances are at finding fish. The high-flow section is often less productive than the low-flow section. The hatchery section opens on January 1st and fishes well to about March. Egg patterns, San Juan worms, and attractor nymphs are the go-to during the early months. Swinging alevins can be productive however they start working better as more fry and smelt start to develop. You can find these baby salmon concentrated near the bank and in softer water. Try to fish during an overcast or when the water is tinted to maximize your chances of hooking up. Although most anglers will gather in the hatchery section during the winter, steelhead can be found throughout the system. The closer you're fishing towards the hatchery the better. The spring is my favorite time of year to fish the Feather. The weather is more comfortable and most of the winter crowds are gone. 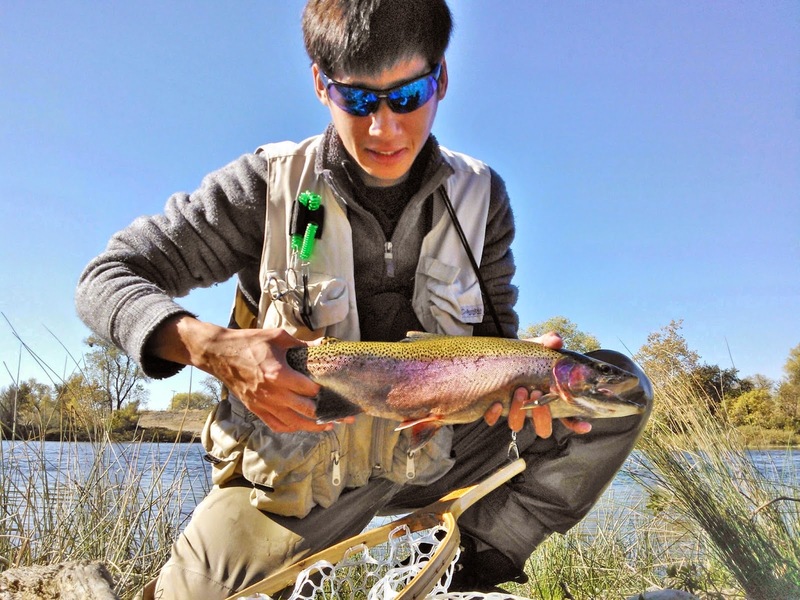 Most of the spring-run steelhead are a mix of half-pounders and adult fish. These fish don't tend to be as big as their fall-run cousins but they fight the hardest. 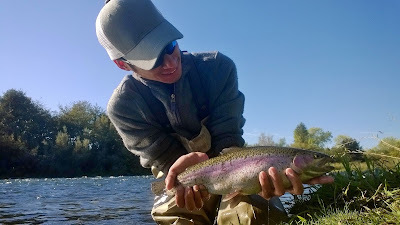 Spring-run steelhead are the most beautiful fish in the Feather River. Fly selection can vary a lot this time of year but I find that caddis and bright patterns tend to work the best. Bird's nests, prince nymphs, and similar flies in a size 14 are my go-tos this time of year. The Sacramento suckerfish will spawning in February and March therefore sucker spawn patterns can work well. You also have the option of swinging nymphs this time of year especially when the water warms up in April. I'm not entirely sure if the fish caught in the summer are summer-run or spring-run but they are there. 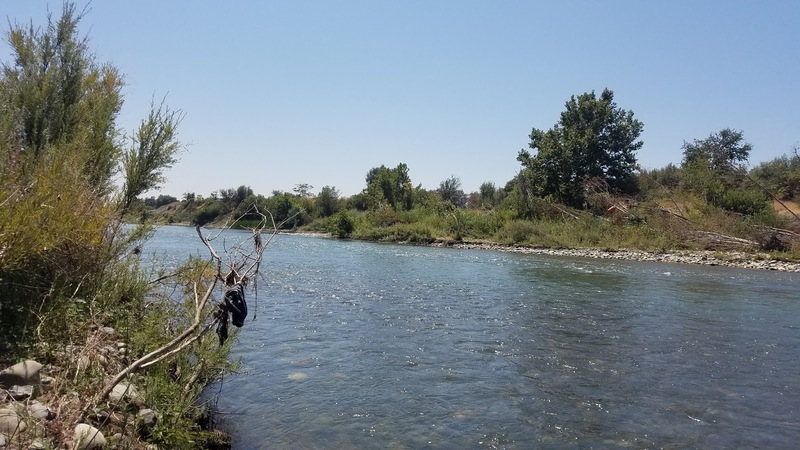 The summer is perhaps the toughest time of year to fish the Feather River. Fish early and get off the water by noon. I've had the most luck nymphing with midge and bright patterns during this time of year. Cover water and keep moving until you find some fish. The fall is the best time of the year to fish the Feather. Starting in September the salmon will begin to return to the river to spawn and the steelhead will be following behind. Most of the fall-run steelhead are adults ranging from 18'' - 22''. These fish are darker in complexion compared to the spring-run. Fall on the Feather River tends to be the most crowded season of the year especially during weekends in October and November. 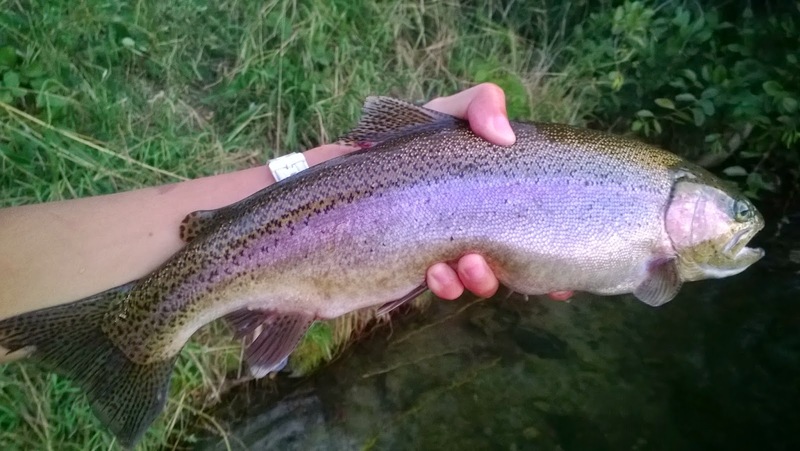 Try fishing lower down the river but don't go too far past the Outlet. Fly patterns that work during this time of year are egg patterns, caddis pupa, San-Juan worms, and attractors. These fish aren't too picky and the secret as always is finding them. They don't call them the fish of a thousand casts for nothing. Indicator nymphing is the most common and productive fly fishing tactic used on the Feather River. The patterns you will need to use will depend on the time of year. 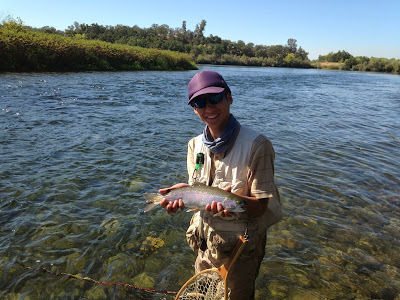 Swinging is less common on the Feather River however it can still be productive. A floating line is usually all you'll need for swinging but a Type-III versileader can help you reach the deeper pools and runs in the system. I've had success swinging streamers for Feather River steelhead but I don't use them when the salmon are spawning. If you find yourself continuously flossing and snagging then you aren't fishing correctly. 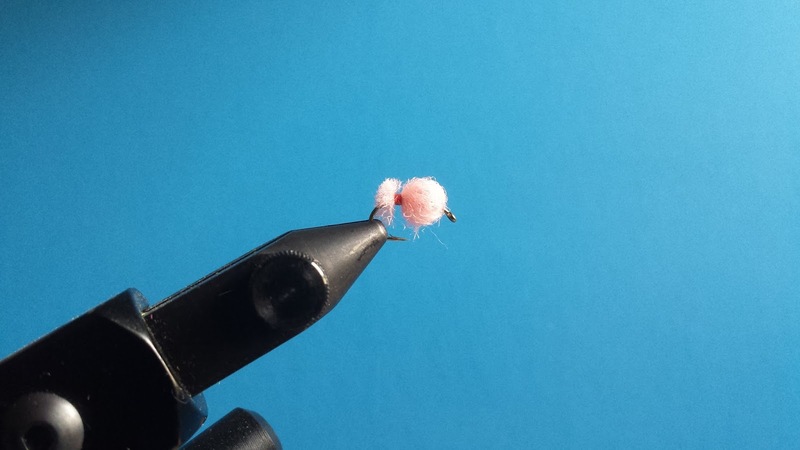 Add more weight or cast and mend upstream so that your egg pattern drifts below the salmon. 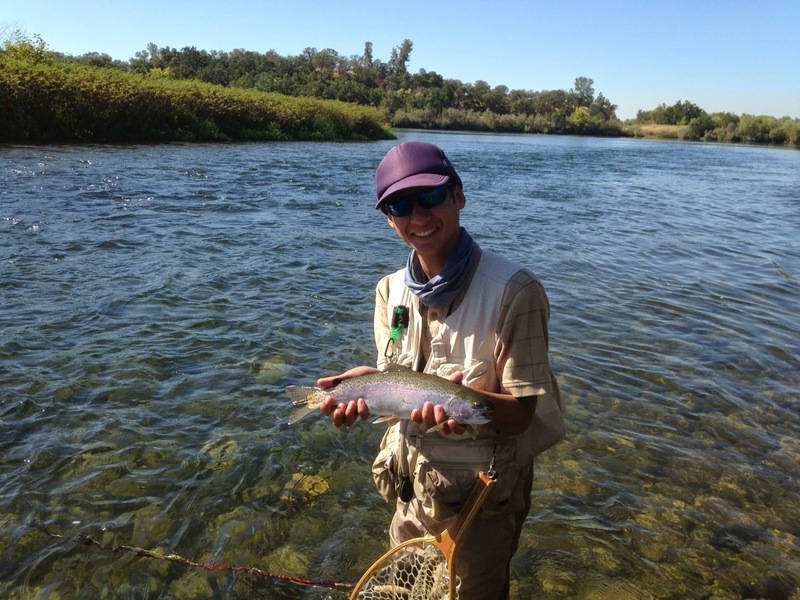 The most important aspect of fishing the Feather River is finding water that has not been fished. This river can get very crowded during the spring and fall, especially the latter, so plan your visit accordingly. Try fishing the access points downstream and work your way upstream to avoid driftboats that are drifting down the river. Fish early in the morning before everyone gets on the water or later during the day when everyone has left. The afternoons tend to be tough unless there is a good run of fish. The low-flow section is usually kept at 600-900 CFS and the high-flow section at 1200 CFS. You can find out the current flows/release by calling the automated flow release recording (530) 534-2307. Cover water and fish every nook and cranny that looks fishy. Steelhead fishing is a game of hide-and-seek. Stay alert and be prepared to hook into chrome when you least expect it. Watch where others are hooking up and mark that location in your head. Steelhead are well-known to preoccupy the same holding spots as they work their way upstream. Caddis are the primary food source for the fish in the Feather River. The majority of the fish I catch come off of various caddis patterns. A steelhead on a caddis dry is possible if you are lucky enough to hatch a caddis hatch in the spring. The spring-run and fall-run fish will hold in different spots for whatever reason so you'll have to do some exploring to find which spots are productive. 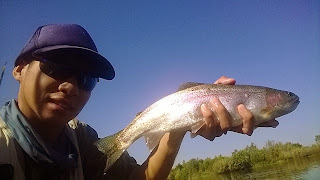 Sacramento suckerfish, hardhard, and pikeminnow are common catches when fishing for steelhead on the Feather. 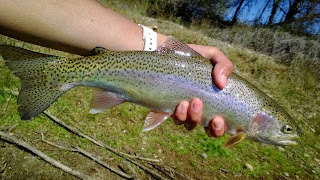 If you happen to catch one of these don't be discourage, they are a sign that you are doing something right. It is possible to fly fish for salmon in the Feather River however they are notoriously difficult to catch on a fly. Swing big bright steelhead patterns on an 8WT switch rod through riffles and runs in the morning or late in the evening when the salmon are active. The Oroville Wildlife Area is open one hour before sunrise and one hour after sunset. The strain of steelhead found in the Feather River don't get as big as their coastal cousins but they fight and pull just as hard. These fish are more "football" shaped and average 18'' - 22'' however there are some big 10#+ fish that show up in the Feather River system each year. Be sure to have your DFG Steelhead Tag Card signed before you fish. This river is patrolled quite frequently by DFG wardens so pinch down your barbs in the hatchery section and know where you can and cannot fish for salmon. Don't leave valuables in your vehicle. The Oroville area is notorious for its transients and tweakers. If you end the day fishless then welcome to the club. Steelhead fishing is difficult so keep calm and fish on.